Daisies. Some speculation as to which composite flower sometimes called a daisy appears in #1. My guess is an inula, maybe elecampane (Inula helenium), whose common and scientific names are a giant tribute to Helen of Troy. Elecampane, Inula helenium, also called horse-heal or elfdock, is a widespread plant species in the sunflower family Asteraceae. It is native to Europe and Asia from Spain to Xinjiang Province in western China, and naturalized in parts of North America. … The plant’s specific name, helenium, derives from Helen of Troy; elecampane is said to have sprung up from where her tears fell. It was sacred to the ancient Celts, and once had the name “elfwort”. noun elecampane: a plant that has yellow daisylike flowers with long slender petals and bitter aromatic roots that are used in herbal medicine, native to central Asia. Inula helenium, family Compositae. ORIGIN late Middle English: from medieval Latin enula (from Greek helenion [Helen again] ‘elecampane’) + campana probably meaning ‘of the fields’ (from campus ‘field’). This entry was posted on March 28, 2019 at 1:20 pm and is filed under Art, Language and plants, Names. You can follow any responses to this entry through the RSS 2.0 feed. You can leave a response, or trackback from your own site. About those “daisies”… well, I’m coming back to them, because the word is on my internal “confusing translations” list. 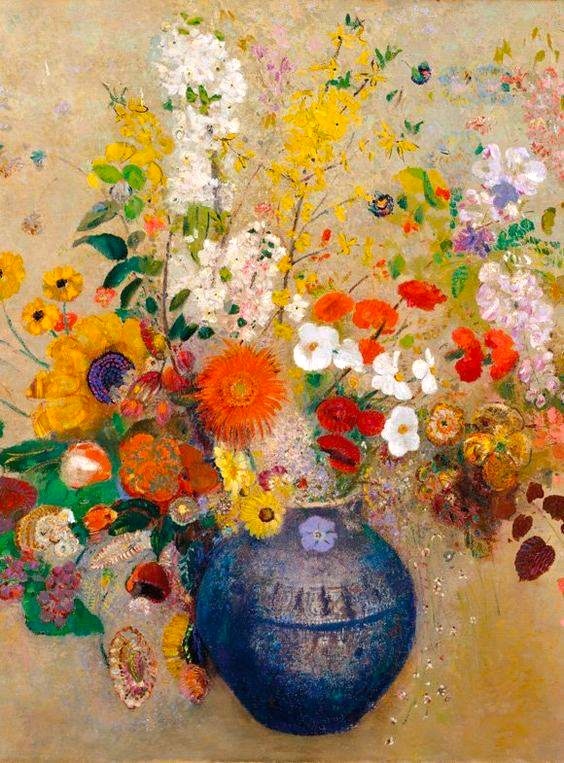 The painting (#1) is owned by the Kröller-Müller Museum in the Netherlands, and I mostly see it listed under the title “Flowers in a blue vase” (like #2) or on its home page, “Bloemen in blauwe vaas”. 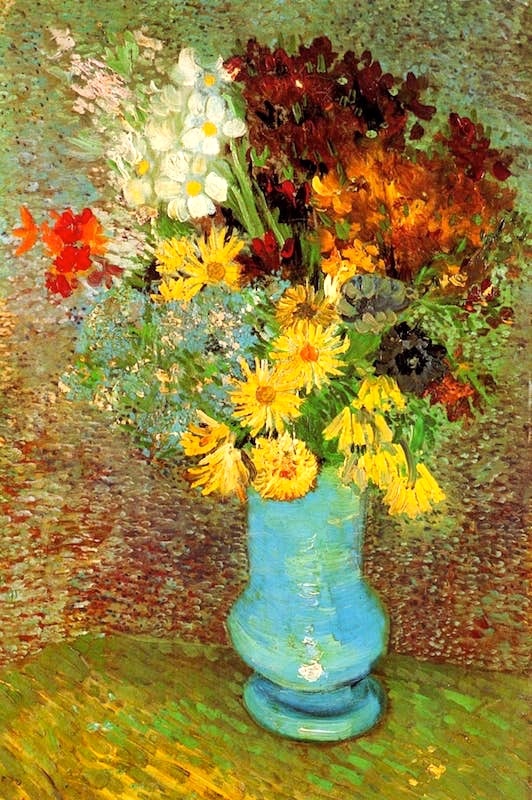 (The K-M Museum has more of the genre Bloemstilleven: https://krollermuller.nl/search-the-collection/genre=Bloemstilleven/object_type=Schilderijen/ ). In 1887, if I am (as per Wikipedia) not mistaken, van Gogh lived in someone’s place in the Montmartre neighborhood of Paris. I’m sure there were private and public gardens as well as empty lots with poor soil that would have had wild flowers. These yellow flowers look familiar, in the sense of not exotic, not in the sense of “I should know those”. 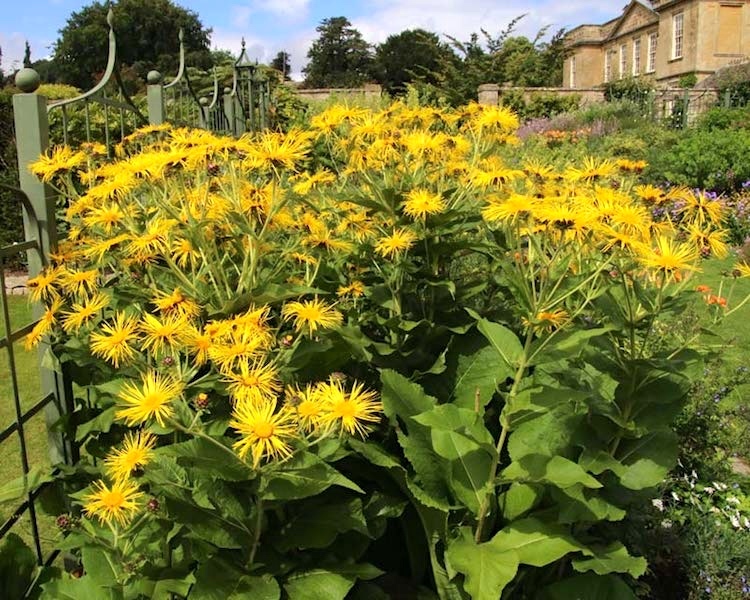 Inula helenium exists in France and can be found on lists of recommended garden plants (as “grande aunée”). It could be it! But OTOH, it has large leaves that don’t look at all like the small-leaved greenery in the vase. Which, of course, could be from another one of the flowers. Poking around in French lists of yellow garden flowers, there are a few more options, including Coreopsis and wild or cultivated lettuce (which I thought of, TBH, given how common these are in fallow lots in Europe: https://fr.wikipedia.org/wiki/Laitue ) .